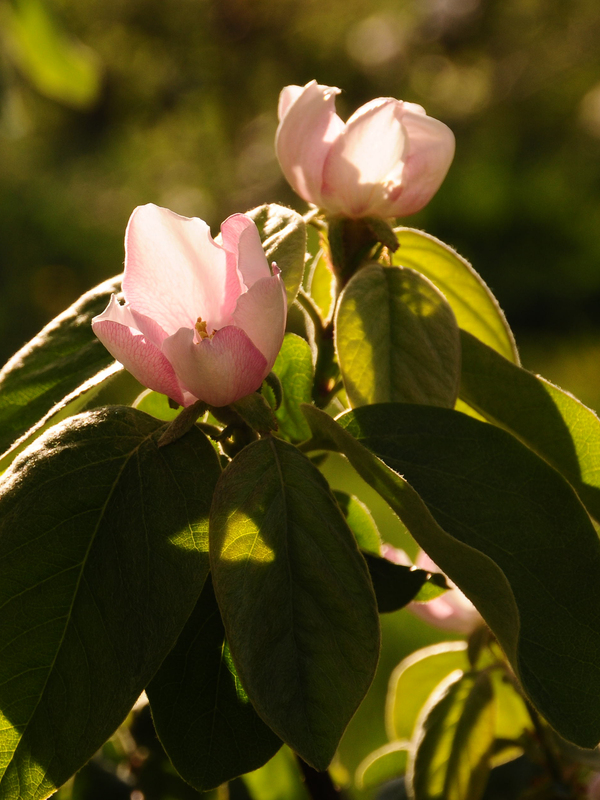 While much of the orchard is planted with apples, one will find—beyond the rows of Baldwin, Orleans Reinette, and D’Arcy Spice—small, graceful quince trees with fuzzy-backed leaves. 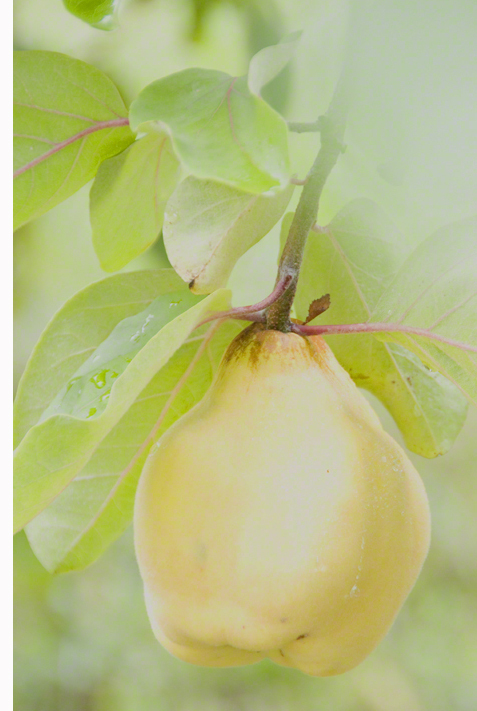 Quince, which is related to the apple and the pear has similar scent and flavor profile with overtones of guava and maybe hints of pineapple depending on the variety. 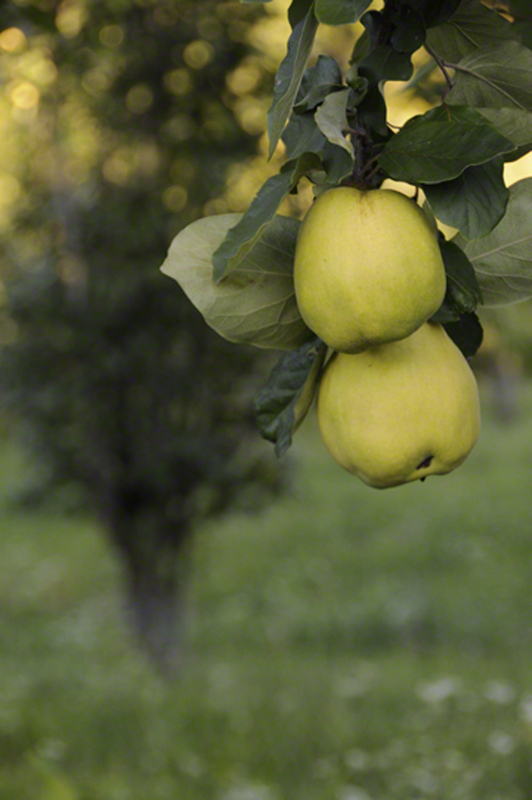 When fully ripened, quince may scent a room, and they are a treat to eat, whether poached, roasted, pureed or baked. But they are never ever eaten raw, as they have a hard, gritty, grainy, astringent flesh. 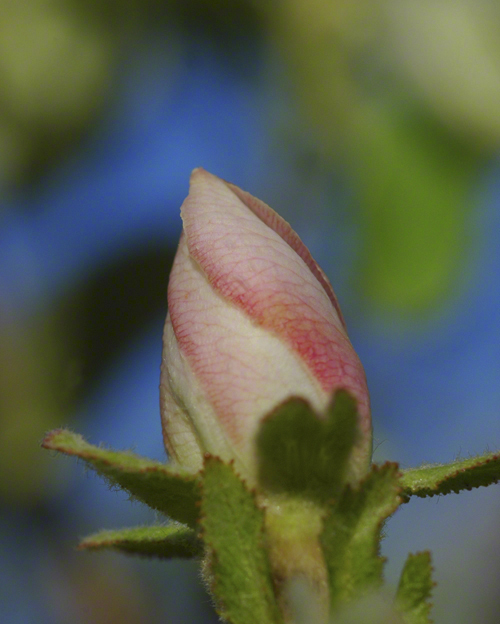 My husband, David Tansey, and I take frequent walks through the orchard, and from bud until harvest, we like to keep an eye on the development of the quince, delighting in the tightly furled, pink buds that untwist into crimson-veined, cup-shaped blossoms. The immature fruits are covered in a beige-pink, felt-like skin that turns green as the fruits size. 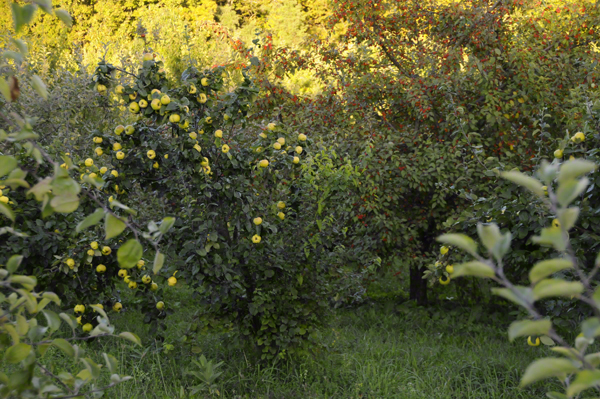 By October the quince take on a sunny, golden yellow color, and whether the variety is pear-shaped or flattened and round, they brighten the orchard at midday and lend a glow in the early evening. 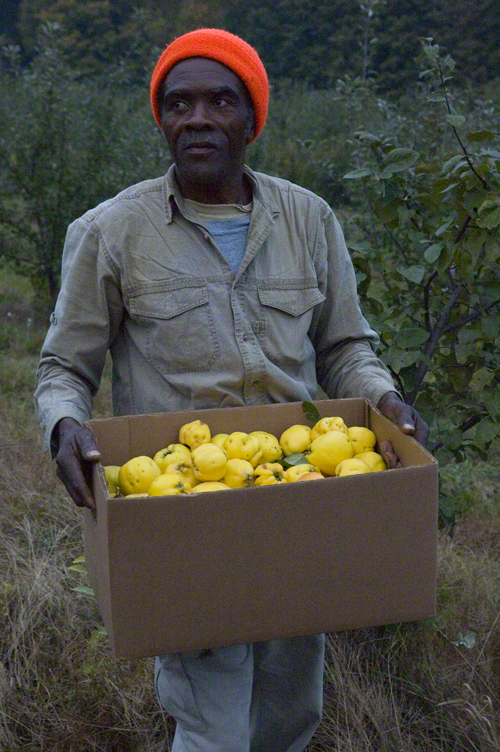 Quince (Cydonia oblonga), a native of Persia, have been cultivated for over 4,000 years. Searching for quince lore we read about paintings of Venus depicted holding this fruit of love and happiness in her right hand, and it is quite possible that it was quince and not apple that got Adam’s Eve into trouble. Quince paste, so thick you can cut it with a knife, is a traditional food in the Mediterranean. The Portuguese call it marmelada, the Spanish membrillo, and in Sicily everyone gets into the act when quince are ripe to make cotognata. It is delicious with sharp or creamy cheeses, a treat on morning toast, or as a sweet end to a meal. Below is a recipe for poached quince. But one of the easiest ways to prepare quince is to toss unpeeled, cored chunks of it into the roasting pan alongside freshly harvested carrots, chopped lovage, onion and a leg of lamb. We do the same when roasting a chicken, deglazing the pan with white white, or better yet, Calvados, to make a sublime juice to drizzle over the meat and vegetables. This year we will surely add quince to the preparation of our Christmas goose. Rub quince under running water to remove any fuzz. Cut in quarters or eighths, leaving skin and core intact (they add additional levels of flavor and pectin). Put in pot with water to cover, along with the sugar. Bring to boil then simmer slowly. The quince should be soft after 30 minutes and can be used as is, or add a tad more water if needed and poach them for two more hours; they will turn a pale pink, and if you have patience, simmer them a bit longer to coax them into a beautiful ruby hew. Cool the poached fruit, remove the seeds and core, and add pieces to an apple pie or Tarte Tatin, or serve on ice cream or yogurt. Don’t toss out the syrup, as the resulting elixir is good for the throat. 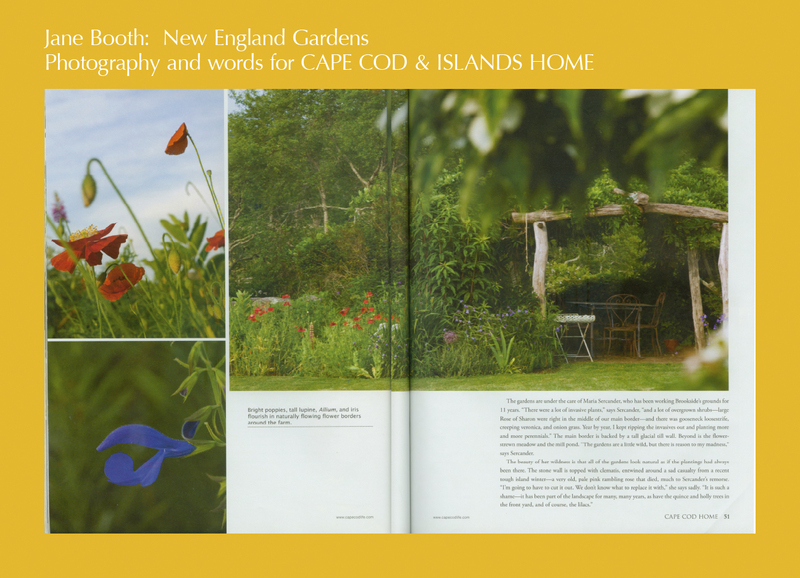 Please ask Jane Booth for permission to reproduce her copyrighted photographs and/or writing. Email jane.booth.1@gmail.com or call (802) 866-3329. 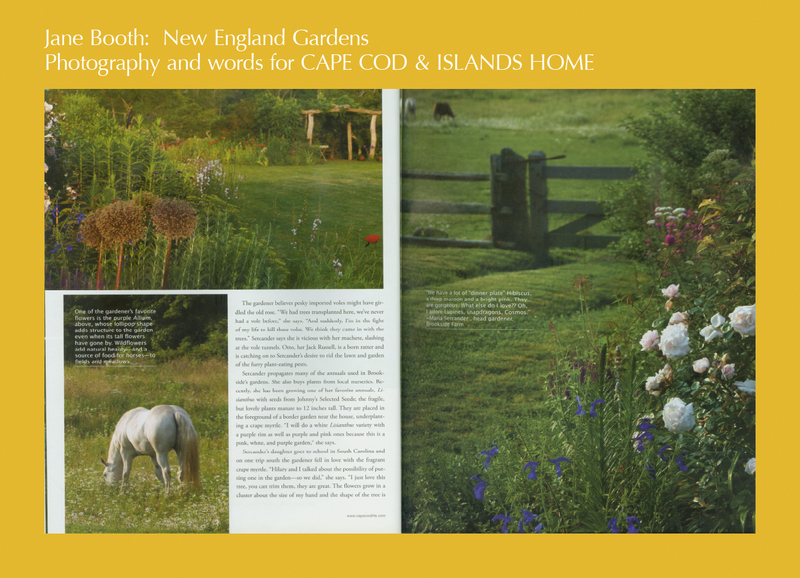 Jane has spent a good part of her career photographing and writing about gardens and small farms for Gardens Illustrated, Yankee Magazine, Country Living, Country Living Gardens, Better Homes & Gardens, New Old House Journal, and Cape Cod & Islands Home where she produced an ongoing column and feature stories. David Tansey is the founder of The Landmark Trust USA and past president of Landmark and The Scott Farm, both located in Dummerston, Vermont. 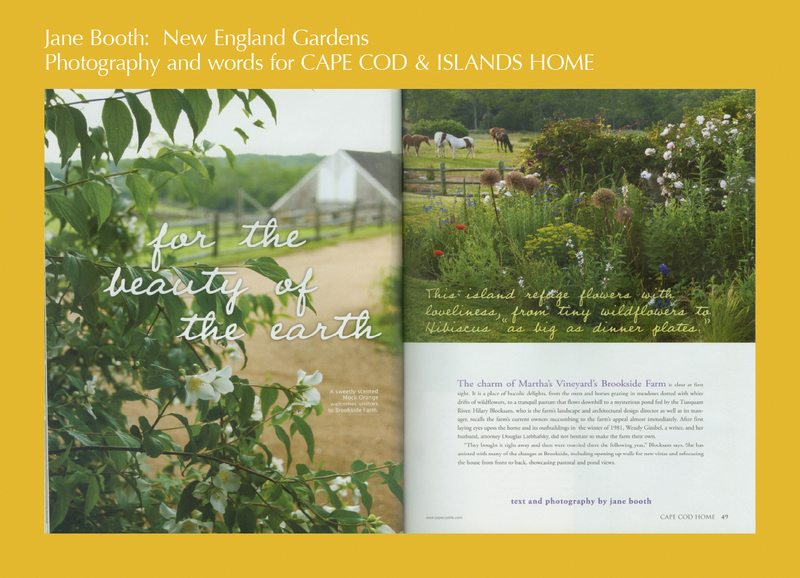 He was involved in every step of revitalizing The Landmark Trust USA and Scott Farm properties. 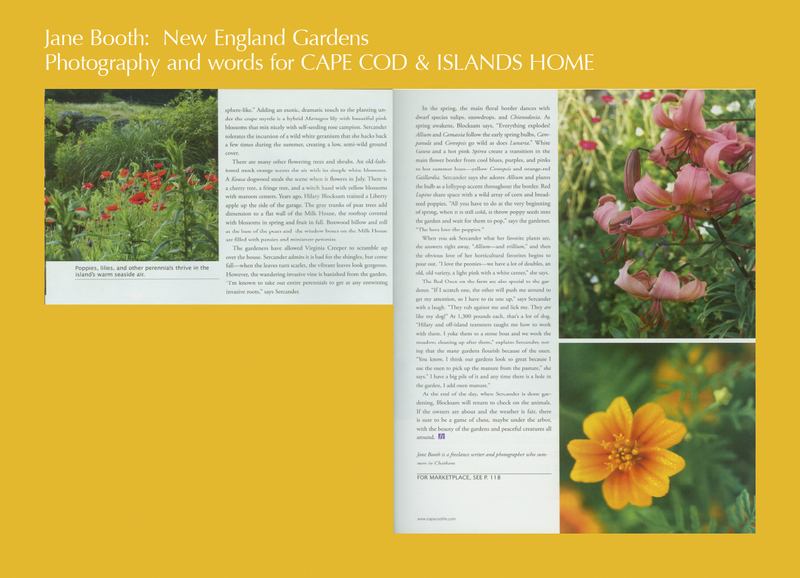 This entry was posted in cooking with orchard fruit, Published Works, Quince and tagged cotognata, Cydonia oblonga, David Tansey, food, fruit, heirloom apple orchard, Heirloom apples, Jane Booth, Jane Booth garden photographer, Jane Booth garden writer, Jane Booth writer, Jane Booth writer/photographer, marmelada, membrillo, poached quince, quince, quince paste, quince photographs, quince pictures, quince recipe, Vermont local food on October 16, 2012 by Jane Booth.